In October 1993, the fate and future of the Russian state was decided in bloody clashes in Moscow. The long political crisis erupted in an armed struggle that claimed hundreds or, according to some sources, thousands of lives. The winners were left with a country that was already economically crippled, but extremely rich in resources. The losers were relegated to decades of political opposition. RT presents a brief overview of the political and economic developments that preceded the crisis. One of the key features of the standoff between the President and the Parliament is possibly the fact that the opposing parties were very close allies almost until the actual fighting broke out. Aleksandr Rutskoi, Ruslan Khasbulatov and almost all MPs supported Boris Yeltsin in August 1991 during the so-called Putsch, or Coup D’état. At that time, a group of top Communist Party officials supported by the KGB and military commanders attempted to stop the Perestroika – reconstruction - course initiated by Mikhail Gorbachev and prevent the signing of the treaty that would replace the Soviet Union with the Commonwealth of Independent States. Gorbachev was isolated in his governmental holiday home in the Crimea and an emergency situation was announced in Moscow as the coup leaders attempted to seize power. This move was met with strong protests by the pro-democracy community and the leadership of the Russian Soviet Federative Socialist Republic (RSFSR) – back then still an internal republic of the USSR. Its top officials – President Boris Yeltsin, Vice-President Aleksandr Rutskoi and Parliamentary Speaker Ruslan Khasbulatov were equally interested in breaking away from the central command and acted together. Their HQ was located in the RSFSR House of Soviets – the same White House that became the center of the 1993 events as former allies became enemies. It was also in 1991 that Yeltsin became allies with Pavel Grachev –the commander of Airborne Troops who deployed forces to Moscow, but changed sides quickly after this, providing the reform-minded leaders of the Russian Federative Republic with military support. After mass popular protests and the resolute actions of the RSFSR authorities, the Putsch failed and Gorbachev returned to Moscow. However, the real winners chose not to hand back the power they had just obtained and Gorbachev, resigned first as the head of the Communist Party of the Soviet Union, and several months later as the Soviet President once the Soviet Union ceased to exist after the signing of the Belavezha Accords in December 1991. The power went to Yeltsin and his supporters, who went on to dissolve the Communist Party and cancel all its privileges. The Russian president also took away the party’s political powers and began to appoint heads of the regions and turn regional soviets into new legislatures. Otherwise the political structure of the Russian Federation remained almost unchanged and the key officials also remained the same – Boris Yeltsin was the president, Aleksandr Rutskoi vice-president and Ruslan Khasbulatov the head of the Supreme Soviet. General Pavel Grachev was awarded with the Defense Minister’s post, but this was done shortly thereafter, in spring 1992. Another powerful Yeltsin ally, Gennady Burbulis, was appointed state secretary of Russia – the head of the consultative body with the president that decided on major political issues. Yeltsin himself took the post of acting prime minister and appointed young economist Yegor Gaidar as his first deputy in charge of the economic policy. Gaidar’s promotion was reportedly proposed and promoted by Burbulis – they met during the august 1991 events and shared both professional training in economics and views on the future reforms in the country. The plan was initiated in 1992. By summer that year every citizen could receive a privatization voucher – an official bill that was accepted as payment for shares in state and municipal enterprises that went on sale. State property was also sold for cash and vouchers could change hands, leading to the existence of voucher funds. These were intermediaries that purchased vouchers from people and either used them for investment or re-sold to those with insider knowledge. However, at the same time as voucher privatization Yeltsin ordered the “liberalization of prices” – officially allowing almost all enterprises in the country to freely set prices for their products. Before this move, Russia still lived under a mostly socialist economy, with the exception for ‘cooperatives’ – relatively small private enterprises specializing in the retail trade and services sectors. The liberalization provided a solution to the problem of deficit of consumer goods, at least to some extent, but it also triggered unprecedented inflation that devalued the population’s savings and allowed very few people to actually invest. Part of the blame for this lay with the Central Bank, which was not reporting to the government, but to the parliament, and was issuing money to cover the financial deficit. At the same time, the bank and the parliament could not ignore the huge social obligations that were Soviet Russia’s legacy and had no sources of income to provide for them. The combined policies of the government and the Central Bank led to growing discontent among the masses. Politicians who were against the growing influence of Yeltsin, Burbulis and Gaidar attempted to use this to secure their own positions. Supreme Soviet Chairman Ruslan Khasbulatov has also repeatedly suggested that Yeltsin dissolve Gaidar’s government. Parliamentary support to this motion was relatively small at first, but it grew as the situation in the country became more desperate. By 1993, Khasbulatov managed to ensure support from the already-established Communist Party of the Russian Federation, socialist-oriented Fatherland caucus, Agrarian Union and the Russia parliamentary group, headed by young nationalist Sergey Baburin. In April 1992, the Sixth Congress of People’s Deputies approved a statement on the course of the economic reform, noting the decline of industry and collapse of economic ties that led to a sharp decline in living standards and growing social tensions. The congress directly accused the government and its consultants both of a poor initial reform plan and of refusing to adjust its course together with heads of major enterprises, trade unions and state officials. The statement also ordered the government to make corrections to the reform plans and to present the amended list of priority measures to the parliament by late May. Yeltsin also had to compromise and replace several government ministers with representatives of Soviet-era industrial monopolies, sometimes without even notifying acting Prime Minister Gaidar. The new government attempted to rein in inflation and at the same time increase the salaries to the most active groups of workers, such as miners. However, by mid-year the new government realized that the social programs could only be financed through raising the budget deficit. The measures proved insufficient and the lack of unity inside the government stalled its work. In December 1992, the Seventh Congress of People’s Deputies rejected Gaidar’s candidacy for PM and Yeltsin replaced him with Viktor Chernomyrdin - a veteran of the Soviet natural gas industry, minister of energy and the future head of Russian natural gas monopoly Gazprom. As a result of the compromise, the Seventh Congress passed a resolution ‘On Stabilization of Constitutional Order in the Russian Federation’ that gave the government the powers to carry on the sales of state property within the framework of privatization and allowing the president, together with the government, to make decisions connected with budgetary spending. The same document ordered the Supreme Soviet to begin work on a new draft of the Russian Constitution and a Federal Treaty to determine the relations between internal regions of the country. The final draft was to be approved by the national referendum scheduled on April 11, 1993. The policy of the Central Bank was to be managed jointly by the government and the parliament. “On the basis of the article 121 of the Constitution of the Russian Federation consider the powers of the President of the Russian Federation Boris Yeltsin completely halted. The work on the draft constitution continued until March 1993, but the sides failed to resolve their differences and eventually switched from quarrels and blame shifting to direct attacks. In March 1993, the Eighth Congress of People’s Deputies approved the new resolution on the constitutional reform that canceled all previous decisions and called for urgent measures to limit the powers of the president and the government. A week later, Yeltsin made a televised address to the nation announcing that the Constitution was temporarily suspended and that he would run the country in an emergency. The address was considered by the parliament-friendly Constitutional Court and recognized as unconstitutional and grounds for impeachment. At the end of the month, the parliament gathered for the Ninth Extraordinary Congress. The majority of MPs voted to impeach Yeltsin, but the decision was not passed because the number of supporters was less than two thirds of the chamber, as required by law. Additionally, it appeared that the official decrees signed by Yeltsin and made public sometime after the TV address were different from what was initially announced and could not be formally considered a valid reason for a no-confidence vote. As a result, the congress passed the decision to call a nationwide referendum on April 25. The referendum is still referred to in Russia by the slogan ‘Da-Da-Net-Da’ (Yes-Yes-No-Yes), invented and advertised by Yeltsin’s spin doctors. This was a short and easy-to-remember formula for people who had to answer the four questions: 1) Did they trust President Yeltsin, 2) Did they approve of Yeltsin’s social and economic policy, 3) If early presidential elections were necessary and 4) If it was necessary to call an early parliamentary poll. In order to be passed, every decision had to be supported by over a half of voters. “We call for an all-Moscow rally of pro-democracy forces against the usurping of power by Khasbulatov and Rutskoi. The future of Russia is now being decided in the capital. The president elected by you has suggested that Russians themselves decide the fate of the new power bodies through elections. Khasbulatov, Rutskoi and their team suggest that all discontent must be jailed or executed by firing squads. We call on all those who want to put an end to the diarchy and chaos, all who are against the civil war and the dictatorship of the Congress to walk together at the Manege Square on Sunday, September 26. The gathering starts between 14:00 and 14:30.” (signed by dozens of popular creative people). The voters’ general turnout was over 64 percent and the referendum was recognized as valid. Its results were in Yeltsin’s favor. However, it turned out that less than half of participants answered the first and the forth questions, and thus they officially remained ‘unanswered’. The referendum that was supposed to resolve the contradictions between the different branches of power only provided both sides new arguments in support of their opposing positions. On May 1 – International Labor Day – thousands of people in Moscow protested against Yeltsin and their rally was brutally dissolved by riot police. Later in May, the president called for the convention of a special committee on the development of the new constitution, and this body commenced its work in early June. The parliament, together with the vice-president, continued to oppose the strengthening of the government and on September 1, Yeltsin issued an order that relieved Rutskoi of his duties, despite the fact that the Constitution contained no instructions allowing him to do so. Officially, the vice-president was dismissed over suspected corruption, but further investigation proved that these charges were based on forged documents. The parliament forwarded the presidential order to the Constitutional Court and announced that it would not be executed until before the ruling was passed. “Our clocks are chiming the hour of courage! The Russian intelligentsia must make their historical choice. An impostor has violated the law and he will answer for this before the people and Russian history. The pathetic attempts to drag cultural personalities into a criminal cooperation have failed completely. Former President Yeltsin is being followed only by those who remain loyal and faithful to the authorities at all times. Another treachery has confirmed the worthlessness and soullessness of such a position. Their shame will remain on their descendants! In these difficult times we call upon Russian citizens to join in their actions to protect the law and express our belief in the courage of every one of our compatriots. On September 21, the president signed the Decree on Constitutional Reform, suspending the work of the Supreme Soviet and calling national elections to the new parliament – the State Duma – in early December. 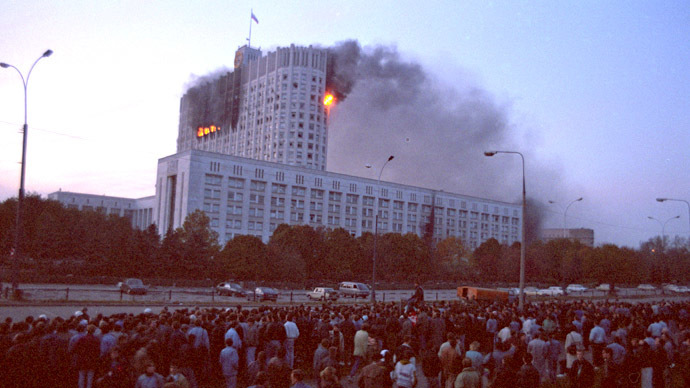 Khasbulatov officially called Yeltsin’s actions a coup d’état, and the Supreme Soviet passed a statement on immediate revocation of all presidential powers. The deputies refused to leave the parliamentary headquarters and security personnel began to distribute assault rifles among MPs and their aides. On September 23, Yeltsin-friendly city authorities cut off power and communication lines from the parliament’s headquarters, informally known as the White House. Rumors circulated that water and sewage lines were also blocked. The governments of Russia and Moscow City demanded that, before October 4, Khasbulatov and Rutskoi order all their people to leave the building and surrender their weapons. On September 30, several APCs were stationed near the White House, but remained in place and did not provoke confrontation. Military units started arriving in the city on orders from Grachev and taking key facilities, such as the TV center in Ostankino, under guard. The tensions reached their climax point and on October 3, open fighting broke out.